Remodeling is almost finished. The bathroom is back together and everything works! At one time it looked like this. 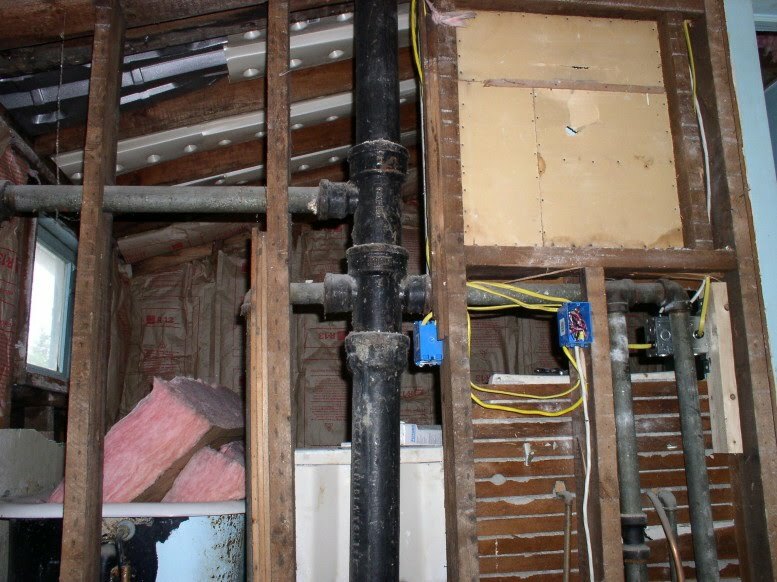 The tub is full of insulation. The medicine cabinet has a hole in the back. 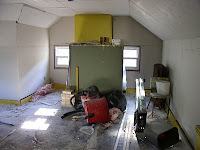 Insulation was applied to the walls, and drywall replaced plaster. The contractor left and DH was to finish the job. They did replace the toilet before they left. Dry wall in progress. The yellow part is the chimney. I don't seem to have a more current picture of that room, but it has the same blue walls and tile floor as the rest. 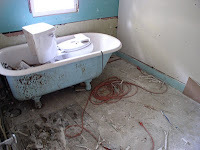 Last week the bath looked like this. 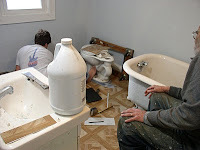 The plumber disassembled everything and replaced the drum trap in the floor. I may have said that we had to replace some floor boards because of old damage and this was the time to replace the trap and put new floor over all. It also let us (DD doing the work) tile under the tub. It's all together now. Baseboards are in. 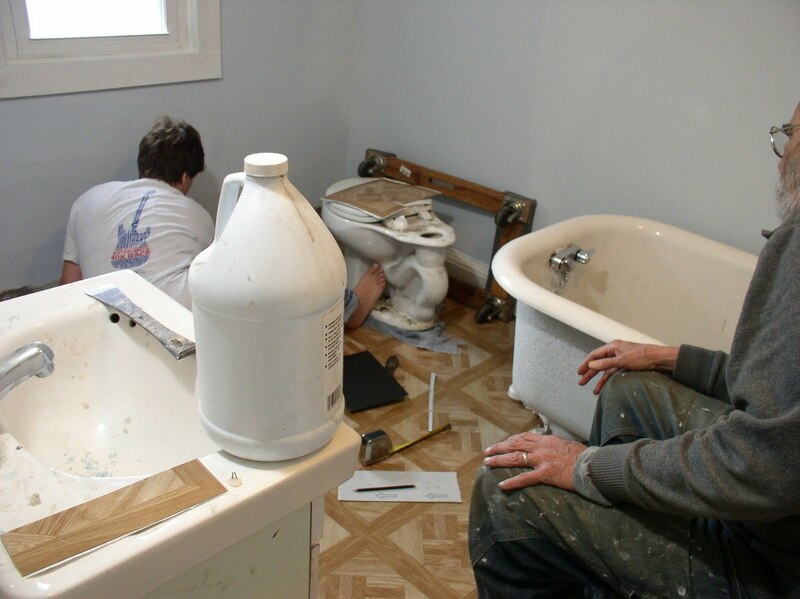 It just needs 1/4 round pieces at the bottom of the baseboards. 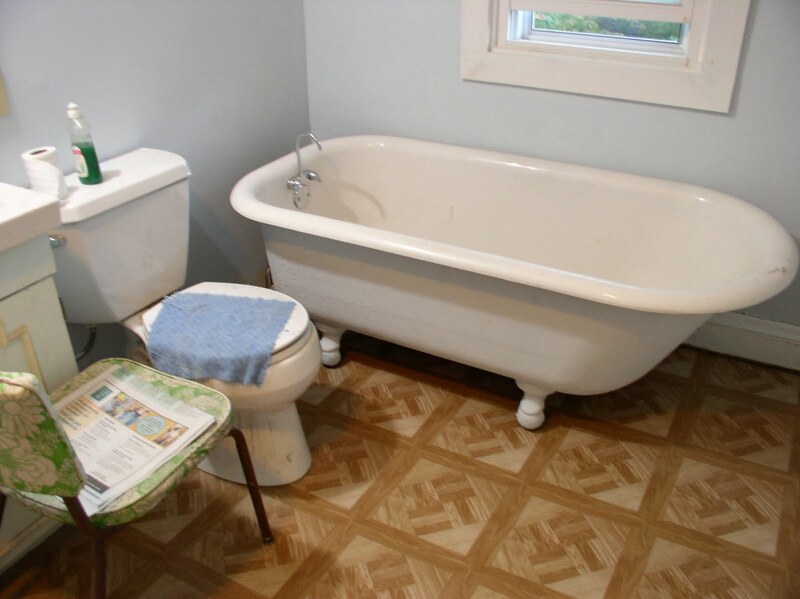 You may notice the faucets changed on the tub. 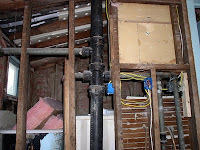 During reinstallation, the overflow piece was replaced and the new faucets on the tub didn't fit any more. Does anyone want a new faucet set with 7" centers? We tiled the whole floor and the stairs with the same tile. I'll get more pictures as we move back in. The white socks took 2nd place in the accessories category of the guild competition. My friend Ginny wore her socks (from the same mystery pattern) to the meeting and entered something else. My other 2 entries did not win prizes. I expected this as my best designs live elsewhere. The fairisle socks for DH have been frogged and reknitting commenced. They were a little tight and a lot short, so I went up one size and am making a longer length. Toe up socks are hard when you don't know how much length the gusset and heel take. I still like how they are working up. Yesterday was a 3 heel day. 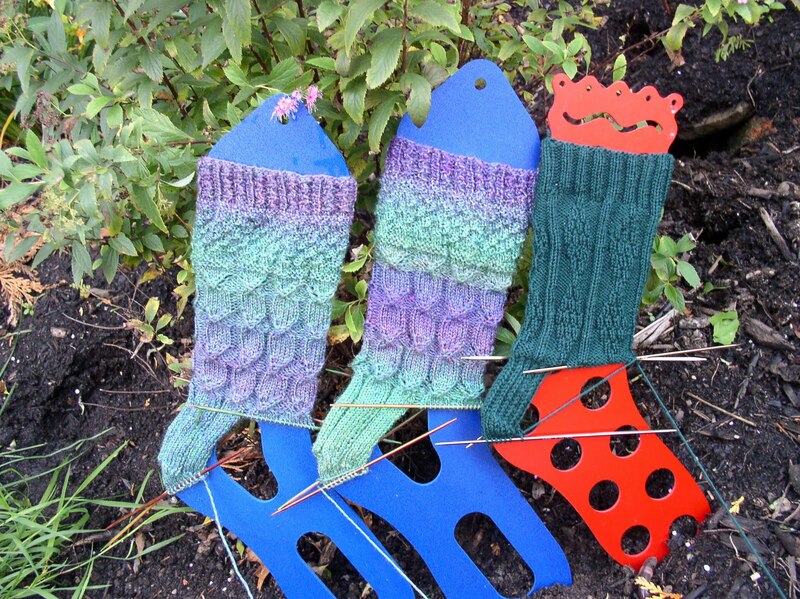 Two mystery socks are finished through clue 3 and the 2nd green sock reached the same spot. The sock blockers stand up nicely with their toes in the dirt. 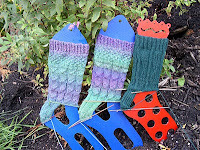 I'm anxious to finish the green socks because I have Christmas stockings to knit and remodel. More on that when I start the work.